If you’re a fan of sashimi, you know that having the taste of fresh ocean melting in your mouth is culinary bliss. Made of raw fish like salmon and tuna, sashimi is high in omega 3 that’s beneficial for your brain and general health. Unless you have a fresh supply of sashimi, you may want to consider taking fish oil capsules as supplements for the much-needed Omega 3. You’ll also find Omega-3 fish oil capsules a highly recommended supplement for dealing with anxiety and depression. Fish oil contains EPA, a type of fatty acids that helps in reducing cellular inflammation in the brain. But if you’re new to taking omega-3 supplements, here is more information to guide you through. Which Types Of Omega 3 Fatty Acids Are Good For You? It’s alright if you can’t remember all the 11 types of fatty acids as long as you have this 3 types in your body. They are the most important types of fatty acids that benefit your body. ALA or Alpha-Linolenic Acid is usually found in plant foods like chia seeds and spinach. ALA is converted to DHA and EPA before being absorbed by your body. Preliminary studies have link ALA intake to reduce nerve damage caused by diabetes. DHA, the abbreviation for docosahexaenoic acid can be found in seafood including fatty fish. You’ll usually find milk formula to be rich in DHA as it plays an important part of brain development and functions in children and adults. Eicosapentaenoic acid, or more popularly known as EPA has the anti-inflammatory quality that helps in treating anxiety and depression. Fatty fish and seafood have a high content of EPA. Fish oil supplements contain both DHA and EPA. The people in Japan are known for their longevity. Their love for Omega-3 rich sashimi may be one of the contributing factors. Here are how taking fish oil supplements capsules may benefit your health. Mental Health – Omega 3 supplements are often recommended to people suffering from anxiety and depression. Studies have found that people with low level of omega-3 fatty acids often suffer from anxiety and depression. Cardiovascular Health – It is a known fact that taking Omega-3 fatty acids can reduce the risk of heart diseases. It helps in preventing blood clots from forming and lower blood pressure. Besides that, Omega-3 fatty acids also increase good cholesterol (HDL) in your body. Eye Health – While studies are not conclusive, taking Omega-3 fish oil is known to prevent deterioration of the eye caused by macular degeneration and cataracts. ADHD – Children suffering from ADHD are known to benefit from Omega-3 fish oil intake. Numerous studies have shown reduced ADHD symptoms like hyperactivity and inattentiveness as a result of taking Omega-3 fatty acids. Inflammatory Disease – Fish oil is known for its anti-inflammatory property that is useful in treating inflammatory disease. Inflammatory diseases are when the human body produces inflammatory response even when no foreign elements are present in the body. Alzheimer Disease – Studies has also shown taking the Omega-3 fish oil can reduce cognitive decline, which leads to Alzheimer disease as one aged. While the benefits of taking Omega-3 fish oil are overwhelming, the questions of what is the appropriate dosage remains. In certain cases, your doctor may prescribe a heavier dosage of Omega-3 supplements for you to address some health issues. Adults are recommended to take 1000 mg-2000 mg of Omega-3 fish oil capsule per day that contains both EPA and DHA. This is equivalent to two servings of fatty fish in a week. But if you’re taking Omega-3 supplements for specific health concerns like anxiety or cardiovascular issues, do consult your doctor for the right amount of dosage. Unless advised otherwise by doctors, never take more than 3000mg of Omega-3 capsules daily. Unlike shopping for fresh salmon, there are some points that you need to consider when you’re trying to purchase Omega-3 fish oil capsules. Types of Fatty Acids – You’ll want to have both EPA and DHA in your fish oil capsules. They are the important types of fatty acids you need for your health. The Concentration of Fatty Acids – A higher concentration of fatty acids in a capsule allows you to absorb more DHA and EPA per serving. The Source of The Oil – Choose brands that use oil from marines harvested in a sustainable manner. Purity Tested – Look for fish oil that is tested for heavy metals, PCB, and other toxins. It’s also preferable that they are certified and tested by the third party. Do your due diligence based on the above and you’ll avoid taking low-quality fish oil that does more harm than good. Remember that cheap is not necessarily better when it comes to supplements. Where To Buy Omega-3 Fish Oil? You can easily acquire Omega-3 supplements from local pharmacies or drugstores. 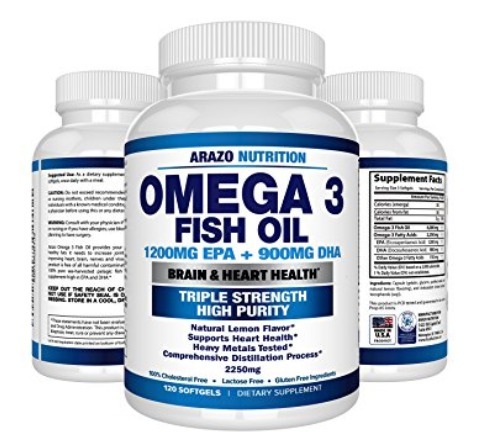 But if you enjoy the convenience of shopping online, Amazon is a great place to buy your Omega-3 fish oil supplements. You get to read from the hundreds of review and decide which brand fits your requirement. With probably hundreds of Omega-3 fish oil brands available, searching for the right one can be pretty time-consuming. To help you save precious time, I’ve researched and selected 10 of the best-rated Omega-3 fish oil supplements. 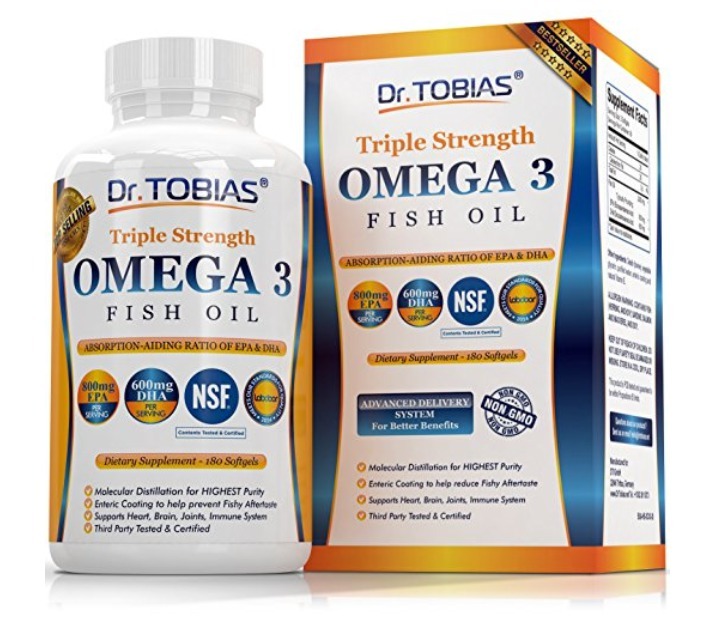 Probably one of the most reputable brands in Omega-3 supplements, the fish oil capsules from Dr. Tobias is made from wild fish and purified by molecular distillation. This ensures that no significant heavy metals or contaminants are present at a level harmful to human consumption. Its triple strength label means you’re getting three times as much of DHA and EPA compared to other brands. By taking 2 capsules of fish oil in a single serving, you will have 800 mg of EPA and 600 mg of EPA to boost your cardiovascular and mental health. You also don’t get an unpleasant fishy aftertaste from these capsules. They have an enteric coating that not only prevents fish burps but also increases the absorption rate of the fatty acids. The coating protects the fish gel from being damaged by stomach acids and allows maximum absorption by the intestines. With third-party testings ensuring the accuracy of labels and product purity, you can take the fish oils without any worries. A single bottle contains 180 soft gel capsules of fish oil. They are good enough to last you for 90 days. Three times more fatty acids per serving. Some may find the capsule hard to swallow. 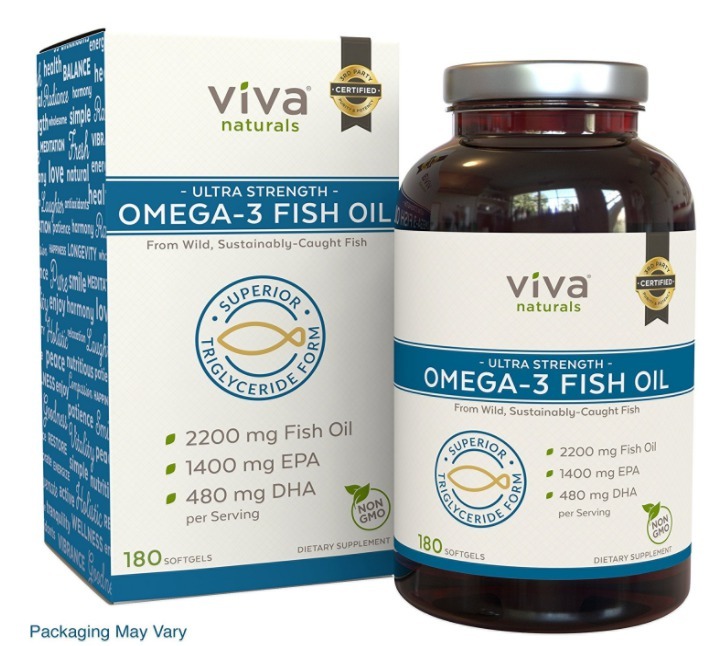 With 1400mg of EPA and 480 mg of DHA in a 2200mg serving, this highly concentrated fish oil from Viva Naturals is produced by a special process called supercritical extraction. It gives you three times more fatty acids in a single serving than other brands. These capsules contain Omega-3 in triglyceride form that helps your body to optimize the absorption of the fatty acids. They are great for your heart health as it increases good cholesterol in your body. Besides, it also improves cognitive health as you grow older. You do not have to worry about mercury in the fish oil. The fish are captured from the coastal sea of Peru using sustainable fishing practice. They are processed with strict quality control and every single batch is tested and certified with IFOS-5 Star. Some people gave up on fish oil due to the fishy aftertaste. Viva Naturals special extraction process ensures that not only the fish oil is free from toxins, but also is purified from unpleasant fishy aftertaste. You can comfortably take these capsules for the next 90 days. 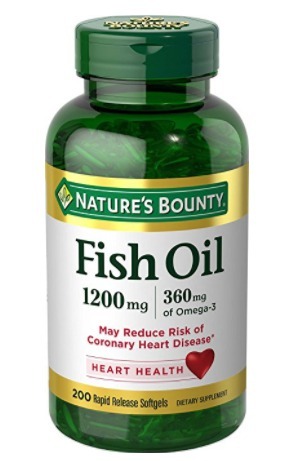 With 150 softgels, this bottle of omega-3 fish oil supplement from Nature Made is harvested from wild-caught fish. They then went through a sophisticated extraction process, that ensures the purity of the fish oil and ensures no harmful level of toxins are present in the oil. The quality of the production process is assured with stringent tests conducted by third parties. The capsules are enteric-coated to prevent fishy aftertaste and to increase the absorption rate. To make swallowing the capsules easier, you can have a cup of water before taking them. If you find your vision is deteriorating due to aging, taking omega-3 fish oil supplements will benefit your eye health. You’ll be assured by the top quality of Nature Made’s fish oil as they are voted as one of the best Pharmacist Recommended Omega-3/Fish Oil Brand. This bottle of fish oil capsules will last you for a while. It has 150 capsules or 75 servings which will bring you just over the 2 months mark. As with any supplements, you’ll need consistency for your body to respond positively. High capsules amount in the bottle. Pill size may be too big for some. The fish oil capsules by Azaro Nutrition are straight from the wild. There are no raised-fish involved in the production of these capsules. Only fish caught from the oceans are used to ensure the highest concentration of omega 3 fatty acids. A single serving, 2250mg, of fish oil capsules has 1200mg of EPA and 900mg of DHA. This higher than average concentration of Omega-3 fatty acids is made possible by the special extraction technique employed. You’ll get more benefits of Omega-3 with a single serving compared with other brands. The oil is also purified by molecular distillation technology, that removes toxins like mercury and PCBs from the oil. They are made in FDA and GMP certified facility, and you’ll be free from worries when you consume these capsules if you’re troubled with anxiety. You won’t be having any unpleasant fish burps later as they are made to prevent that. Instead, you’ll have a slight lemon flavor as you swallowed these Omega-3 packed capsules. With 40 servings size of capsules in a bottle, they will last you for slightly over a month. If you’re looking for well-balanced, non-concentrated Omega-3 fish oil capsules, this bottle by Nordic Naturals will be your perfect choice. It contains 330 mg of EPA and 220 mg of DHA in a serving size of 2000 mg. It’s a great supplement to your on-going healthy diet. You can expect no fish burps as the capsules carry a hint of citrus flavor, thanks to its patented flavoring process. The use of triglycerides also ensures your body easily absorb the fatty acids. Sourced from the wild ocean, the fatty acids from the fish oil will help boost your health. Besides your general health, this bottle of fish oil capsules helps you to gain better cognitive health and increase protection to your heart. It helps to regulate your cholesterol level and lower blood pressure. You’ll need to add this to your supplement if you’re dealing with high stress each day. 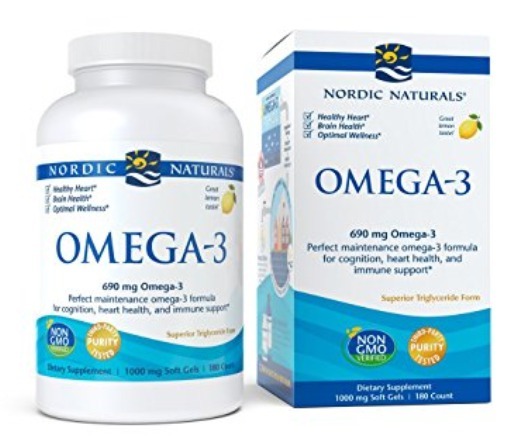 The fact that Nordic Naturals is deeply invested in social responsibility and ethical practices will make you feel safe when consuming these fish oil capsules. Not only the freshest fish oil made it to the capsules, they are also GMO-free, gluten free and no preservatives are added. Tested and certified by a third-party lab. Some pills are stuck together. 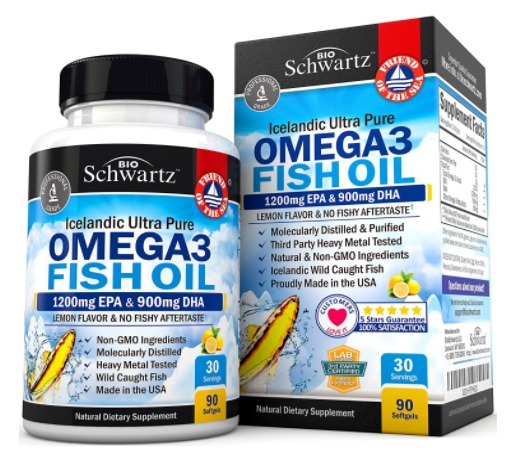 When you need a highly concentrated of an Omega-3 supplement, these fish oil capsules by Bio Schwartz are a great choice. The fish oil is produced by a rare process called supercritical extraction, that results in extremely concentrated Omega-3 capsules. The same extraction technique also ensures that they are purified from harmful contaminants. Besides that, your body will absorb the extracted oil easily and does not get unpleasant fish burps thereafter. What you’ll get is optimized health benefits of Omega-3 fish oil. Each of the batches of capsules is harvested from the fish in the oceans of Iceland where the water is known for its purity and zero-contamination. The oil is then extracted and made into capsules according to a formula created by doctors in FDA certified facilities. Besides boosting brain power, you can also take fish oil for joint paint and arthritis. If you occasionally suffer from high blood pressure, you’ll find great relieve in taking these capsules. A single bottle has 30 servings and will last for a month. Sourced from fishes in the Iceland ocean. High EPA and DHA content. Some find the capsule too large to swallow. 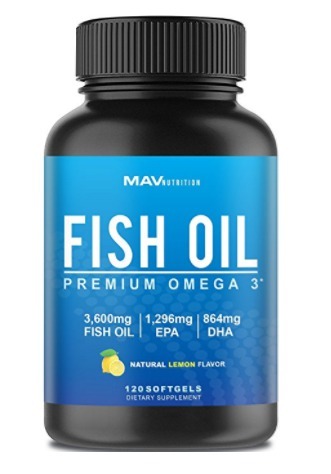 If regular dosages of Omega-3 supplements is not sufficient, try this highly concentrated of fish oil capsules from MAV Nutrition. A serving of 3000 mg contains 1296 mg of EPA and 864 mg of DHA. This is much higher than regular non-concentrated capsules. The oils are harvested from fish caught from the ocean. This means you’re getting fresh omega -3 fish oil in every capsule. They went through molecular distillation extraction to ensure the oil is purified from hazardous contaminants like heavy metal. If you’re constantly having mood swing or bordering on depression, this high-dosage of fish oil can help you to recover your mental health. It also helps protect your heart from developing diesases due to cholesterol and blood clots. Taking fish oil capsules do not necessarily have to be a bad experience of an upset stomach. You wouldn’t have any fishy aftertaste with the special formula of fish oil by MAV Nutrition. A single bottle of fish oil capsules will last for 40 servings. Great for boosting mental health. Some pills are melted together. Harvested from wild anchovies in the sea of Chile, these fish oil capsules by Brain Power+ are processed in GMP certified facility to ensure you have the freshest and pure Omega-3 capsules. The oil went through molecular distillation to remove harmful contaminants. These are highly concentrated Omega-3 capsules with a total of 1400 mg of DPA and DHA in a single serving. They will serve well to boost your mental health. If heavy responsibilities cause anxiety in your life, these fish oil capsules can help you to stay calm and collected in the long run. The manufacturing process involves passing hot steam over the oil to remove any unpleasant fishy odor. You’ll not suffer from any fish burps when taking the capsules. The superiority of the extraction process also means there are no additives included to produce the capsules. Not only do the fish oil undergo stringent testing, more than 50 doctors in the United States trusted and recommends this particular brand of fish oil. 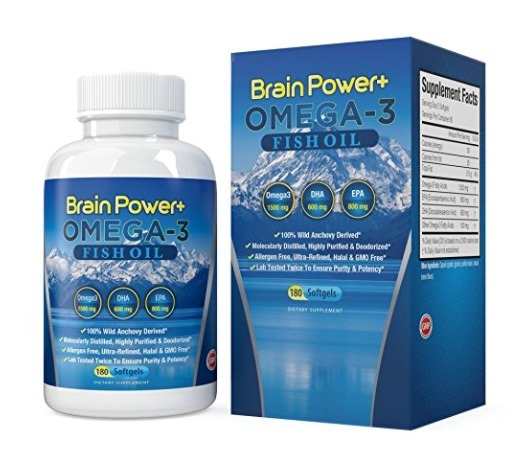 You can expect nothing but the freshest and purest Omega-3 fish oil capsules from Brain Power+. High concentration of important fatty acids. Some capsules gelled into a lump. Sourced from the wild oceans of Peru, where strict regulations ensure regulations of marine resources, the capsules contain pure fish oil that helps you in boosting your cardiovascular health. A single 1200mg dosage contains 360 mg of Omega-3 fatty acids, including the important DHA and EPA. The fish oils are produced in a strictly regulated manufacturing environment with regular testing being carried out to ensure the oils are purified from contaminants. A team of scientist, manufacturing, and quality experts is responsible for ensuring every single batch comply to the highest standards. You don’t get fish burp with these flavorless capsules. Instead, the triglycerides capsules will ensure your body easily absorb and benefits from the fish oil. They will be ideal if you’re trying to make up for Omega-3 deficiencies in a natural way. These fish oil capsules will be great for regulating blood pressure, especially if you’re constantly struggling with a stressful environment. They’ll also be great for your emotional wellness as a whole, as it has a positive effect on your brain. Rigorous testing for quality and purity. The pills may be too large for some. 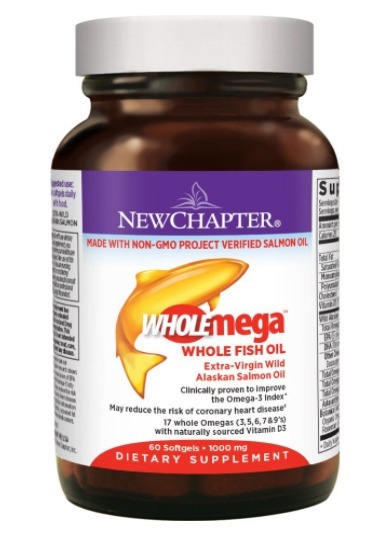 This bottle of fish oil from New Chapter not only contains Omega-3 but also other types of Omega fatty acids and Astaxanthin derived from wild Alaskan salmon. This helps to prevent coronary diseases when taken consistently as it stabilizes the triglyceride levels within two weeks. They are sourced from an ecologically friendly method, meaning no fishes are harmed unnecessarily. The oils are extracted and purified from harmful contaminants. They are NSF tested and certified to be safe for your consumption. You don’t have to worry about quitting fish oil supplement due to the fishy aftertaste. 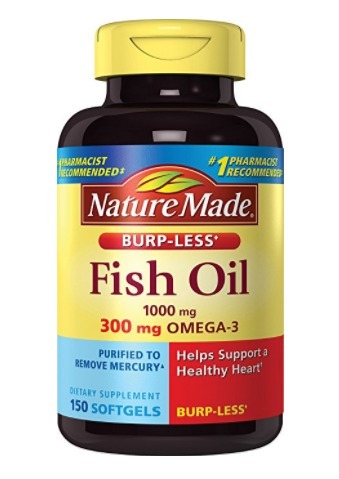 The fish oil capsules from New Chapter would not cause you any fish burps or upset stomach. All you’ll have is the pure benefits of fatty acids equivalent to 3 servings of salmon a week. 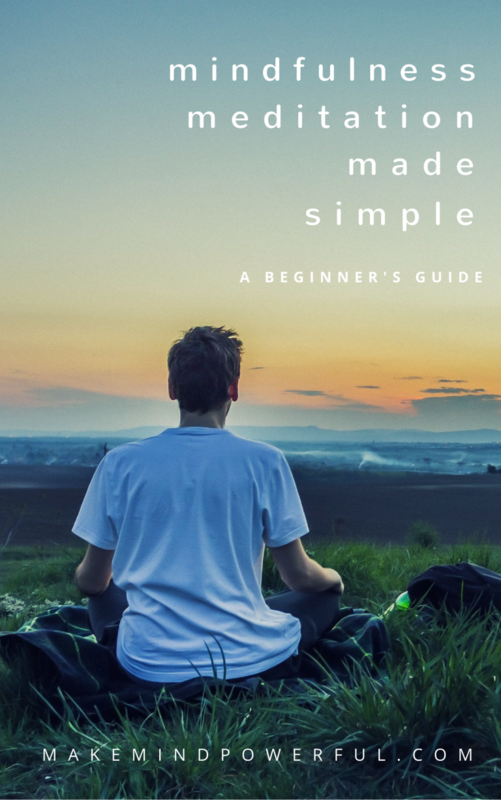 This will be a great addition to your healthy routine, especially if you’re living a hectic life that puts much burden on both your physical and mental health. After all, the vast benefits of Omega-3 supplements are well proven by studies. Harvested from wild Alaskan salmon. NSF certified and purified from contaminants. Helps in improving the health of heart and eyes. Fresh pressed from caught salmon. 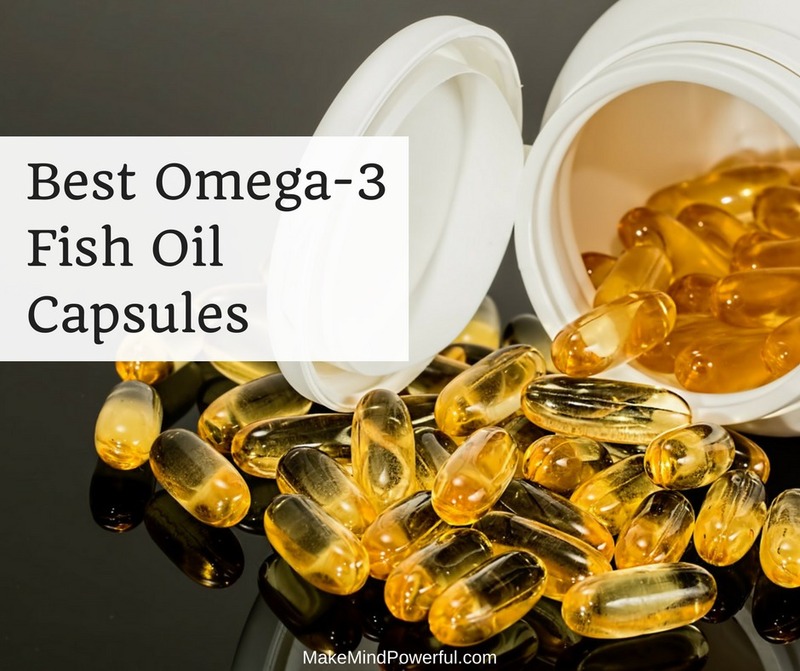 After narrowing down to ten of the best-rated supplements, I hope you have an easier task in choosing the best Omega-3 fish oil capsule for your health routine. Do you take fish oil as a supplement? Do you find your health improves? Share your thoughts in the comment below.